In partnership with Canadian Cancer Society, we will be selling fresh cut daffodils and daffodil pins on campus across 3 days (Tuesday, Wednesday, Thursday) from 10-4 outside on the Green. 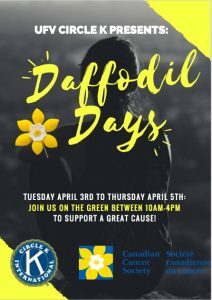 When flowers are bought, it helps support people living with cancer and helps the Canadian Cancer Society fund research to fight all cancers for all Canadians in all communities. Daffodil Month is the national fundraising campaign for the fight against cancer. This April, join the fight and help support Canadians living with cancer.